So, a good friend of mine works at a large retail electronics store. She had to get up bright and early the other day to help out with the iPhone 4S release. Much to her surprise, the shipment didn’t come in… Her husband’s response was something similar to Simon’s response in panel 2. My twisted mind found it funny, and I expect that yours did too. 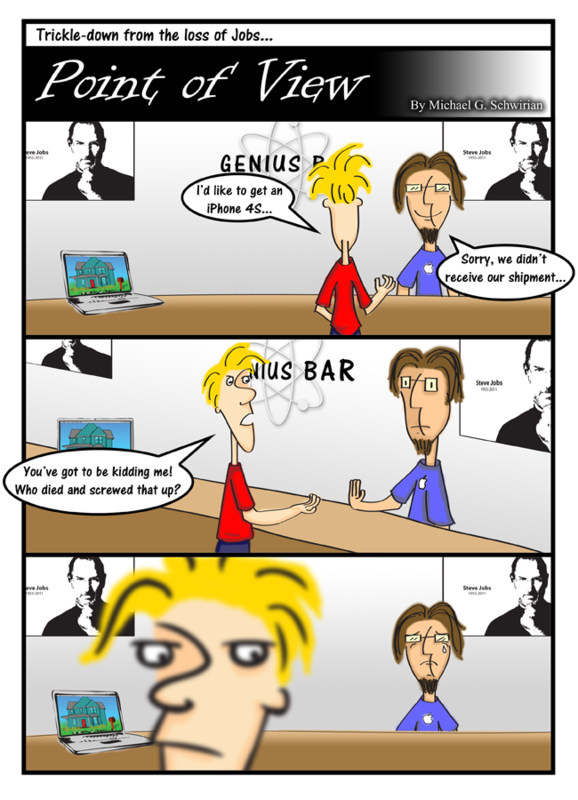 I wanted to do a more respectful comic to honor Steve Jobs, but nothing that I came up with seemed to do the trick. It usually doesn’t affect me when someone famous passes away; Steve is one of those rare exceptions. He changed the world we live in in so many ways and my life is better for it. He will be missed.